Rep. Ron Hubert (R-Milton) questions a bill that would insulate state authorities from being deputized as federal immigration officers Tuesday in the House chamber. 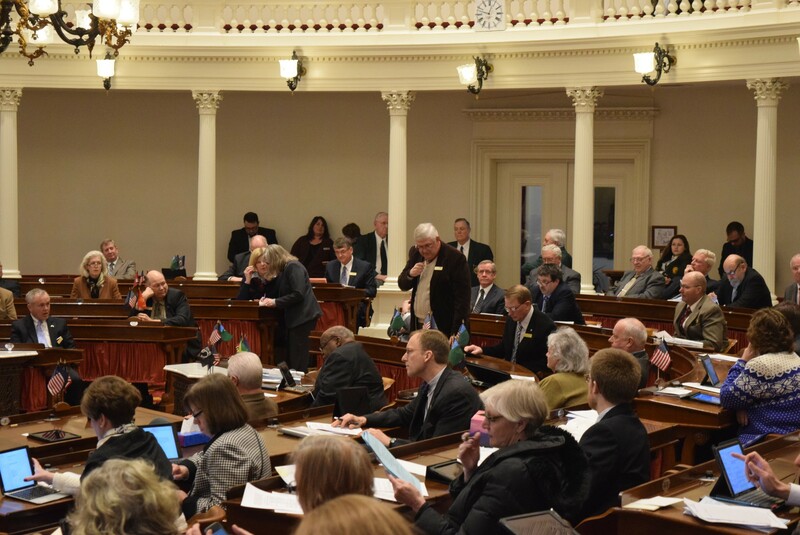 A bill that would insulate Vermont authorities from being commandeered to enforce federal immigration law drew wide support in the House on Tuesday even as some members raised red flags. The bill, which passed the Senate unanimously last month and has the backing of Republican Gov. 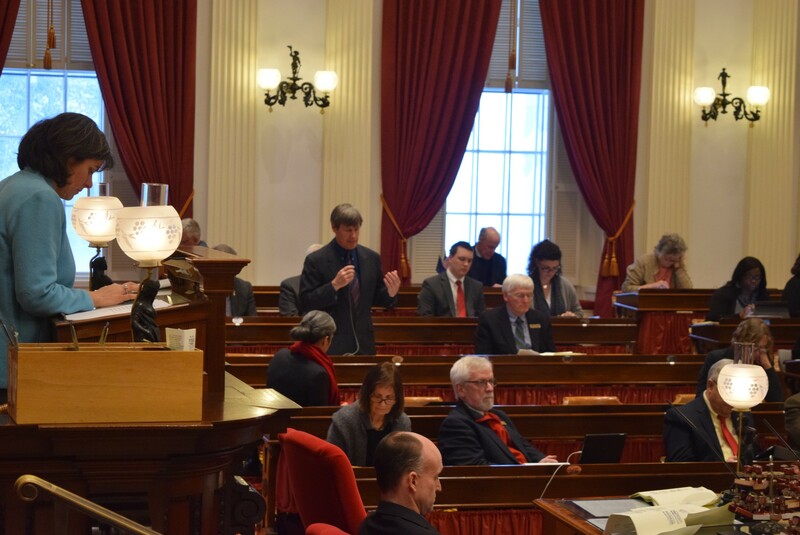 Phil Scott, moved forward in the House with a 110-24 vote. The legislation is intended to gird against President Donald Trump’s immigration-related executive orders. It would preclude Vermont police from being deputized to enforce federal immigration law without the governor’s permission and bar the state from knowingly providing information that could be used to establish a religious registry. Rep. Ron Hubert (R-Milton) peppered Rep. Chip Conquest (D-Newbury), vice chair of the House Judiciary Committee, with questions about possible unintended consequences. Did the committee know that federal border patrol agents outnumber state and local police — and are often the first to respond to crimes in border communities, Hubert asked. How would the legislation affect Vermont police agencies’ relationships with those agents, he wanted to know. “There is an unspoken mutual aid,” Hubert said. “This bill is careful to try not to interfere with the way we address issues of crime,” Conquest replied. Rep. Chip Conquest (D-Newbury) defends a bill that would bar Vermont authorities from knowingly contributing to a federal religious registry. Other Republicans were also uncomfortable with the legislation. Rep. Gary Viens (R-Newport), a retired border patrol agent, had been scheduled to present the bill to his colleagues on behalf of the House Judiciary Committee — a role Conquest took over instead. Viens said he changed his mind after reading a report from Attorney General T.J. Donovan offering guidance to Vermont cities and towns on immigration enforcement. Viens, who had voted for the bill in committee, ended up voting against it on the House floor Tuesday. He declined to discuss his concerns afterward, saying he would wait until after the House takes its final vote on the legislation Wednesday. The vast majority of the body lined up behind it, however. Rep. Oliver Olsen (I-Londonderry) defended the bill by trying to put a face to the immigration issue. When he was in high school at the Long Trail School in Dorset in 1990, Olsen said, one of his classmates was an undocumented immigrant who had escaped persecution in Guatemala. The community protected the privacy of Julio Ixcot, his parents and four siblings, Olsen said. When photos were taken of school activities, Julio and his siblings were included but their faces were obscured to protect their identity, he said. Last summer, Olsen said he came across film negatives he had never printed that showed Julio with his face uncovered. Today, those photos are a reminder of how a Vermont community had looked out for an immigrant family whose children went on to college and eventually returned to a safer Guatemala, he said. This legislation is meant to do the same for a new generation of refugees, he said. “We’re talking about people who have in many cases endured unimaginable suffering,” Olsen said.